ESA's Gaia satellite has looked beyond our galaxy and explored two nearby galaxies to reveal the stellar motions within them and how they will one day interact and collide with the Milky Way -- with surprising results. Our Milky Way belongs to a large gathering of galaxies known as the Local Group and, along with the Andromeda and Triangulum galaxies -- also referred to as M31 and M33, respectively -- makes up the majority of the group's mass. Astronomers have long suspected that Andromeda will one day collide with the Milky Way, completely reshaping our cosmic neighbourhood. However, the three-dimensional movements of the Local Group galaxies remained unclear, painting an uncertain picture of the Milky Way's future. "We needed to explore the galaxies' motions in 3D to uncover how they have grown and evolved, and what creates and influences their features and behaviour," says lead author Roeland van der Marel of the Space Telescope Science Institute in Baltimore, USA. "We were able to do this using the second package of high-quality data released by Gaia." Gaia is currently building the most precise 3D map of the stars in the nearby universe, and is releasing its data in stages. The data from the second release, made in April 2018, was used in this research. While Hubble has obtained the sharpest view ever of both Andromeda and Triangulum, Gaia measures the individual position and motion of many of their stars with unprecedented accuracy. "We combed through the Gaia data to identify thousands of individual stars in both galaxies, and studied how these stars moved within their galactic homes," adds co-author Mark Fardal, also of Space Telescope Science Institute. "While Gaia primarily aims to study the Milky Way, it's powerful enough to spot especially massive and bright stars within nearby star-forming regions -- even in galaxies beyond our own." The stellar motions measured by Gaia not only reveal how each of the galaxies moves through space, but also how each rotates around its own spin axis. A century ago, when astronomers were first trying to understand the nature of galaxies, these spin measurements were much sought-after, but could not be successfully completed with the telescopes available at the time. "It took an observatory as advanced as Gaia to finally do so," says Roeland. "For the first time, we've measured how M31 and M33 rotate on the sky. Astronomers used to see galaxies as clustered worlds that couldn't possibly be separate 'islands,' but we now know otherwise. It has taken 100 years and Gaia to finally measure the true, tiny, rotation rate of our nearest large galactic neighbour, M31. This will help us to understand more about the nature of galaxies." 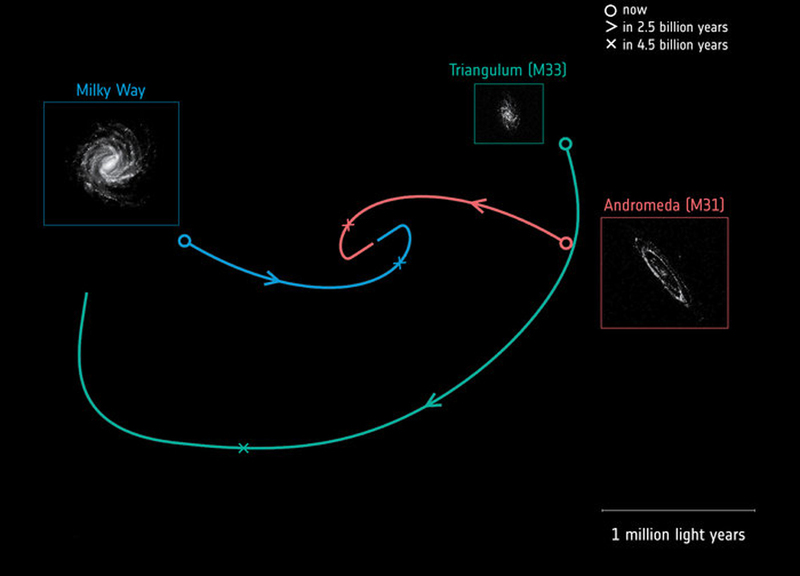 By combining existing observations with the new data release from Gaia, the researchers determined how Andromeda and Triangulum are each moving across the sky, and calculated the orbital path for each galaxy both backwards and forwards in time for billions of years. While the Milky Way and Andromeda are still destined to collide and merge, both the timing and destructiveness of the interaction are also likely to be different than expected. As Andromeda's motion differs somewhat from previous estimates, the galaxy is likely to deliver more of a glancing blow to the Milky Way than a head-on collision. This will take place not in 3.9 billion years' time, but in 4.5 billion -- some 600 million years later than anticipated. "This finding is crucial to our understanding of how galaxies evolve and interact," says Timo Prusti, ESA Gaia Project Scientist. "We see unusual features in both M31 and M33, such as warped streams and tails of gas and stars. If the galaxies haven't come together before, these can't have been created by the forces felt during a merger. Perhaps they formed via interactions with other galaxies, or by gas dynamics within the galaxies themselves. "Gaia was designed primarily for mapping stars within the Milky Way -- but this new study shows that the satellite is exceeding expectations, and can provide unique insights into the structure and dynamics of galaxies beyond the realm of our own. The longer Gaia watches the tiny movements of these galaxies across the sky, the more precise our measurements will become." Reference: "First Gaia Dynamics of the Andromeda System: DR2 Proper Motions, Orbits, and Rotation of M31 and M33," R. P. van der Marel et al., 2019 Feb. 7, Astrophysical Journal [https://iopscience.iop.org/article/10.3847/1538-4357/ab001b, preprint: https://arxiv.org/abs/1805.04079]. ESA's Gaia satellite was launched in 2013 to create the most precise three-dimensional map of one billion of the stars within the Milky Way. The mission has released two lots of data so far: Gaia Data Release 1 on 14 September 2016, and Gaia Data Release 2 on 25 April 2018 (the latter of which was used in this study). More releases will follow in coming years.